Grove Press, Black Cat, 9780802123329, 224pp. Enter the small, rural town of Glanbeigh, a place whose fate took a downturn with the Celtic Tiger, a desolate spot where buffoonery and tension simmer and erupt, and booze-sodden boredom fills the corners of every pub and nightclub. Here, and in the towns beyond, the young live hard and wear the scars. Amongst them, there's jilted Jimmy, whose best friend Tug is the terror of the town and Jimmy's sole company in his search for the missing Clancy kid; Bat, a lovesick soul with a face like a bowl of mashed up spuds even before Nubbin Tansey's boot kicked it in; and Arm, a young and desperate criminal whose destiny is shaped when he and his partner, Dympna, fail to carry out a job. In each story, a local voice delineates the grittiness of post boom Irish society. These are unforgettable characters rendered through silence, humor, and violence. 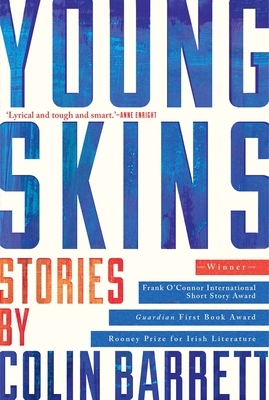 Told in Barrett's vibrant, distinctive prose, "Young Skins" is an accomplished and irreverent debut from a singular new voice in contemporary fiction.